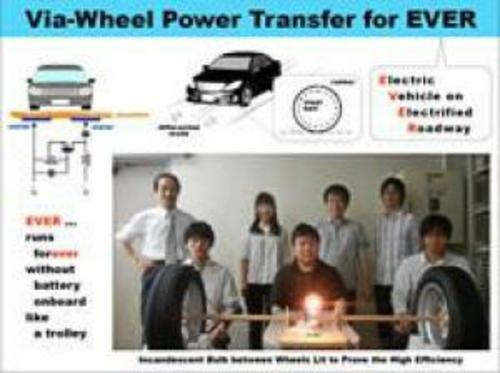 A group of researchers in Japan have demonstrated a system to wirelessly charge an electric vehicle, while it's driving, through the tires. If this wireless charging system is ever deployed it will mean effectively infinite electric vehicle driving range and no waiting time while recharging the car. The results of a small scale demonstration were reported on Wednesday via the International Microwave Workshop Series on Innovative Wireless Power Transmission. The research team is lead by Takashi Ohira at Toyohashi University of Technology in Japan. They have been working on this idea for a couple years, and built a 1/32rd scale electric car using the system. The concept is to build an inductive circuit between the steel belt embedded in tires, and electrodes buried beneath the road surface. Because of insulation from the rubber in the tires, and the road surface, the researchers used a high frequency signal to penetrate the tire into the steel belt. The steel belt would then be connected to the car, feeding power into an on-board energy storage unit that then drives the motor that moves the car. The demonstration car moved successfully with a power penetration efficiency exceeding 75% with a 52 MHz signal. This made the worlds first demonstration of electric power transfer via the car wheel to drive a vehicle. The current hurdles to electric vehicle adoption are driving range that many think is too short, a recharge time many think is too far, and the high purchase cost. Many trains and street-cars are electrically driven with no range limitations or issues about paying for large battery packs. The trick in that case is rather than to store electricity on-board, electricity is provided by wires, and trains can even travel at high speeds over 200 miles/hr driven electrically. Because the model for electric cars is to store energy on-board, the electric car purchase price must pay for a battery pack. Battery packs must be recharged with a protocol that requires a long recharge time (currently), battery packs are costly (currently), and with current technology can only store enough kilowatt-hours for relatively short journeys. In other words, continual recharging while the car is driving would address the hurdles to electric vehicle adoption. But the solution means rebuilding the road system to include power transmission pads embedded in the road surface. There were a pair of full scale demonstration vehicles of wireless recharging, not through the tires, that illustrate the potential. In June, Momentum Dynamics demonstrated a wireless fast charging system they're targeting at shuttle buses. There are tens of thousands of shuttle buses driving on fixed routes around cities, airports, and campuses. They stop every so often to load and unload passengers, and Momentum Dynamics wants to use that stop as a recharging opportunity. Their system is automatic enough the shuttle driver can simply park over a charging pad, and the system automatically starts charging the vehicle while the driver goes about their duties with passengers. In November, Utah State University demonstrated a different wireless charging system on a city bus, and are also targeting the shuttle bus use case. On the other hand battery technology is in continual research and development. Battery researchers and car company CEO's are hinting at a breakthrough in battery energy density and cost within a few years. For example, GM's CEO Dan Akerson in August talked about a 200 mile range electric car, from GM, in a few years. In March, he spoke about a 140 mile range Chevy Volt. In February, Envia Systems announced claims of a battery technology that would give twice the energy density of current lithium-ion batteries at 1/4 the cost. GM Ventures has invested in Envia Systems. A week ago, GM's Jon Lauckner, the head of GM Ventures, spoke in China about GM's R&D efforts to develop affordable electric cars, predicting that electrified cars would displace petroleum, because of energy density increases and cost decreases. There are two different directions of research being taken to address electric vehicle range limitations. On the one hand researchers, like Takashi Ohira's team are looking into different means of wireless energy transfer. Implementing that research means changing the road system infrastructure to accommodate wireless energy transfer, and raises the question of how to pay for the infrastructure and electricity costs. Other researchers are working on advanced battery technology that will cost less, recharge more quickly, and hold more energy. The quest to supplant petroleum with electricity will end up at one of these two places. It's one solution. But I doubt it's going to be the utilized solution. Think of the infrastructure cost to wire our millions and millions of miles of roads. Battery packs are only temporarily expensive. It's a problem of low manufacturing volume. EV batteries don't contain huge amounts of expensive materials. Costs will drop with economies of scale. Battery packs currently give us inadequate range. The threshold for acceptability is probably about 180 miles with <20 minute, 90% rapid recharging available on our travel routes. Drive 180, charge 20 minutes, drive 160, charge, drive. You will be able to drive a 500 mile day with about the same amount of stopping now done using liquid fuel - once to fill-up, once to eat. We've already got <20 minute, 90% charge ability. The Nissan Leaf battery stores 120 Wh/kg. Electrovaya makes a 210 Wh/kg battery that Chrysler tested in its PHEV. That battery heats up when being rapidly charged so it needs an active cooling system like the Volt uses, but it would take the 75 mile range Leaf to 131 miles. Envia has a 400 Wh/kg battery that they expect to be producing in a couple of years. That would give us a 250 mile range Leaf. EVs should become as cheap or cheaper than current cars/light trucks. A solid 200 mile range would be the range that almost anyone would need. A few PHEVs could fill in the last niche. An electrified roadway would work, I just don't see it making financial sense.